About - Pedal The Rails! Let’s learn about Railriders. As you begin your journey along this historic timber railroad you will see Mt. Rainier in the distance. 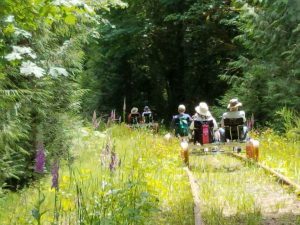 You will pedal through fir, cedar and maple trees, and see the lush moss and fern covered edges of Goldsborough Creek which winds along through the trees. You will pedal over bridges and might see a salmon or two who have returned to the Creek along with King Fishers and other wildlife. You will be lulled by the sights, smells and silence of the countryside, while invigorated by the fresh air. Take a break from the hustle and bustle of everyday life and pedal a Railrider. Please, no rushing, take time to absorb the moment. The unique Railrider quadricycle has four wheels that ride the rails, four adjustable seats, and pedals that propel you along at your speed. Each Railrider features two cup holders per seat which accommodate most common 20 oz. size water bottles. Young children in car seats are welcome to ride with you strapped to the adjacent seat. All of our units are 4 seat Railriders. You will remain on your Railrider throughout the duration of your trip with a brief time to get off and stretch your legs while your guides turn around the Railriders at our mid-point. Departures are available at 9 a.m., Noon and 3 p.m., for our Camp 1 (421 W. Hanks Lake Road, Shelton, WA 98584) departure site. We are open five days a week, Thursday through Monday (closed Tuesday and Wednesday) through early October. Reservations are encouraged, especially during holidays, June-August, and for groups or those on a fixed schedule. CHECK-IN: Please check in at our departure site at 421 W. Hanks Lake Road, Shelton, WA 98584. 30 minutes prior to your departure. We generally begin seating 15 minutes prior to departure. 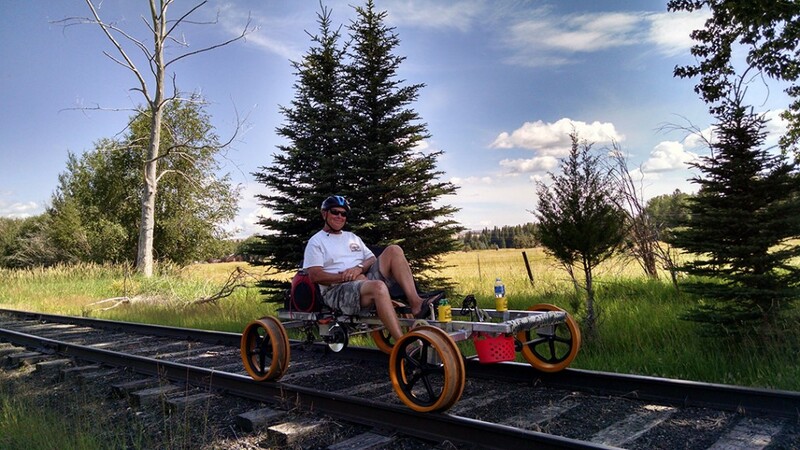 Kim Metlen demonstrates pedaling a Railrider.